TechCrunch has gone through and recently found multiple references to allowing donations be sent to participating causes straight through the app. Earlier this month, Facebook said at its Communities Summit that early forms of fundraising will be rolled out this year through stickers. This will work similarly to Facebook donations to approved causes, but work straight the the Instagram app. I see this becoming huge when it gets it because of the more visual nature of Instagram. The next time donation calls out for a natural disaster, it will be much more powerful being able to see Instagram stories of people affected and video clips of relief efforts done with the donation CTA at the end. This graph from recode shows the rapid rise in daily story users. Because it dates back to June ‘18, I would argue that the appropriate number is somewhere closer to 40% now. Fundraising stickers are just one way that stories will be made more interactive. With polls and drawings a part of stories now, smart brands will begin to create loyal and dedicated fans by creating interactive content. It’s one thing for a user to be marketed to. But in an incredibly noisy world, it is paramount that the user feels as if they are being marketed with. 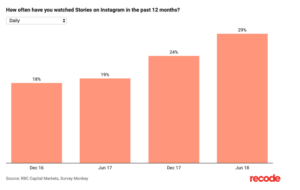 In the next year, instead of a story just showing a static ad announcing a new color, I foresee polls driving engagement ahead of time to allow users to pick their favorite colors and follow the product from inception to market. This makes them feel like they were part of the process, and this “ownership” would make them more likely to want to invest in the product they had been following for day, weeks, or months. 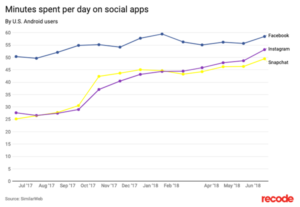 It doesn’t matter what your platform of choice is, one thing is for certain: users are continually spending more and more time on social media every day. In Mark Zuckerberg’s Q4 ‘18 earnings call, he described Instagram as “one of the areas I’m most excited about this year is commerce and shopping . . . there’s also a very big opportunity in basically enabling the transactions and making it so that the buying experience is good.” Last year, I noticed that Instagram posts started to have tags which took me straight to the product page of the item I was looking at. It’s pretty easy to see a not-too-distant future where the line between social media and eCommerce starts to blur even more. When a post has my attention, it’ll be super easy when you can buy a product straight through the app without having to open multiple pages. With this line blurring, savvy marketers will need to be able to easily track every last click, swipe, or touch, or risk being left behind.